KING DIAMOND will return to the UK this June, to play their first indoor UK show in 15 years. This exclusive UK show takes place Tuesday 21st June at London’s O2 Forum Kentish Town. One of the most massively influential artists in the rock and metal scene, KING DIAMOND’s incredible vocal performances under both his own name, and his former band MERCYFUL FATE – which featured current Motörhead drummer Mikkey Dee – has demanded the attention and adulation of fans across the globe. The Danish singer also counts a number of high profile artists in the world of metal as fans, including the likes of Dave Grohl, who invited KING to guest on his PROBOT album, Trivium’s Matt Heafy, who collaborated with the Danish singer on the ROADRUNNER UNITED project, as well as being covered by METALLICA, who as well as inviting KING DIAMOND to perform alongside them on stage, immortalized him as a playable character in their 2009 video game Guitar Hero: Metallica. KING DIAMOND will host his first full UK indoor headline performance in over 15 years at London’s O2 Forum Kentish Town on 21st June, where they will, as part of their live set, perform the iconic “Abigail” album in its entirety for the first and possibly last time ever in the UK, as well as numerous other hits. This will be the most ambitious theatrical horror production by KING DIAMOND to date. Both sonically and visually this will take the band to a whole new level. MONSTER MAGNET will return to the UK next March for an exclusive one-off show in London for a live celebration of their decade on A & M records. Their only UK show of 2016 will take place at the O2 Forum Kentish Town on Saturday March 19th 2016. Home to hugely successful acts such as Soundgarden, Extreme, The Police, Bryan Adams, Sheryl Crow and many many more, A & M released four albums from Monster Magnet between 1993 – 2003, including their commercial breakthrough “Powertrip”, which was at the time album of the year in both Metal Hammer and Kerrang! magazines. and that makes it exciting for us and hopefully you too! To coincide with the tour, on Feb. 12th, 2016 Spinefarm Records/UMG will be releasing newly remastered versions of the classic A&M albums “Superjudge”, “Dopes To Infinity”, “Powertrip” and “God Says No” with loads of bonus audio and new liner notes written in conjunction with Dave Wyndorf. Each album will be released on 2LP and 2CD – with at least one LP side of bonus material, and the second CD of each set containing only bonus content. Tickets go on sale Friday 13th November at 9am here. 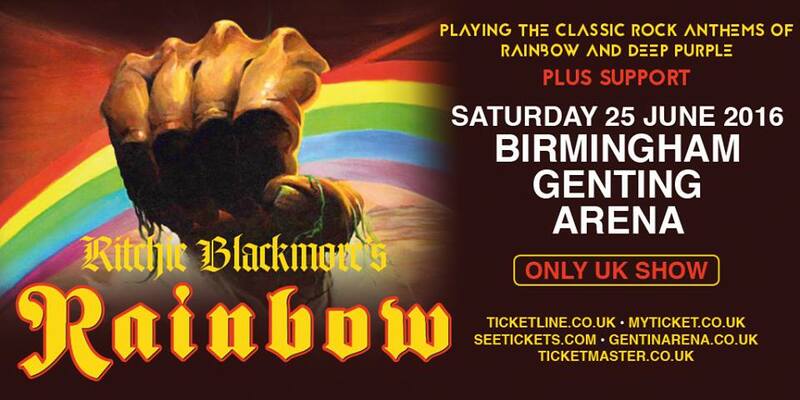 The official Ritchie Blackmore Facebook page have announced that the one-off RITCHIE BLACKMORE’S RAINBOW UK show in Birmingham is sold out. Tickets for the show, scheduled on Saturday 25th June 2016 at the Genting Arena went on general sale today, Friday 6th November, but many were already sold during the pre-sale which started on Wednesday. Fans are eagerly awaiting for the line-up to be announced for the show, which is one of only three rock shows taking place in 2016. Guitar legend Ritchie Blackmore will also play two Monsters Of Rock Festival appearances in Germany on 18th June and Loreley, Freilichtbühneon on Friday 17th June.